Why get a master's degree in psychology from Washburn? You will begin interacting with clients in our clinic during their 2nd semester of training. You will receive training in empirically supported treatments, which is highly valued by employers. You will have a large number of internship sites to choose from for your off-campus clinical training. We guarantee you an internship. You are immediately eligible for licensure in Kansas as a Temporary Licensed Master’s Level Psychologist (TLMLP) upon graduation. Our graduates work at many mental health facilities throughout Kansas. These sites often prefer to hire Washburn graduates because they are familiar with the excellent training that they receive. You will receive clinical supervision from the same faculty who teach their courses in our training clinic (Washburn University Psychological Services Clinic). This creates a seamless connection between what is learned in coursework and expectations in clinical training experiences. Students who choose to go on to a doctoral program report that Washburn's master's program did an excellent job preparing them for their doctoral work. 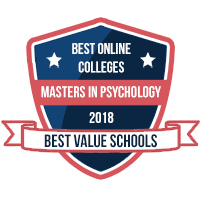 Our program is currently ranked as #33 in the BestMastersInPsychology.com’s list of the most affordable small colleges for a master’s in psychology. Read more here. Q 1. Is your program accredited by the American Psychological Association? A 1. The American Psychological Association does not accredit masters level programs, only Ph.D. programs. Q 2. Does your program meet state licensing requirements? A 2. Graduates of our masters program are eligible for licensure in the state of Kansas as Licensed Masters Level Psychologists. More detailed information is available at the Behavioral Sciences Regulatory Board web site, www.ksbsrb.org. Q 3. What about licensing requirements in other states? A 3. States vary in the requirements for licensure, particularly at the master’s level. It is very important that you research the requirements for licensure within the state that you want to practice in to determine whether your program of study fits those requirements. Graduates of our master’s program have gone on to practice in states all over the country; however, they have often had to take several additional classes or do additional supervised clinical work to practice in a state other than Kansas. Q 4. What's the theoretical orientation of your faculty? A 4. We feel that students benefit from being exposed to a variety of approaches to maximize their effectiveness with different client populations. Our psychotherapy techniques courses focus on the development of cognitive-behavioral, interpersonal, brief, and client-centered psychotherapy skills. Students are exposed to a variety of other approaches (e.g., family systems, group) through other coursework and internship. Q 5. I've heard that you can't do psychotherapy unless you have a Ph.D.
A 5. Not true. Masters Level Psychologists provide much of the psychological services in the United States. Although regulations may vary from state to state, most states recognize the professional contributions of masters level psychologists. Q 6. Can I do private practice with just a master's degree? A 6. Again the regulations for licensure vary from state to state. In Kansas, individuals with a masters degree in psychology, like the one offered by Washburn, after passing an exam and obtaining additional supervised experience, are eligible to become Licensed Clinical Psychotherapists (LCP's). LCP's in Kansas can do private practice. For more detailed information, see the web site of the Behavioral Sciences Regulatory Board, the state agency that licenses psychologists at www.ksbsrb.org. Q 7. I still really want to get my Ph.D. Will it hurt my chances of getting into a Ph.D. program if I do a master's program first? A 7. Although this varies from Ph.D program to Ph.D. program, our experience has been that students who complete our program are better prepared and more competitive for Ph.D. programs after completing our program. Students develop not only solid clinical skills but also the research skills that are necessary for completion of a Ph.D. degree. Graduates of Washburn University’s Master’s Program in Psychology with an emphasis in clinical skills are eligible to take the Examination for Professional Practice of Psychology (EPPP) in order to become a licensed master’s level psychologist (LMLP) in Kansas. Some of our graduates go on to a doctoral program, and some of our graduates find jobs in other states; therefore, not all of our gradates take the EPPP in Kansas. The information below is for our MA graduates who took the EPPP in the state of Kansas during the last 5 years. We note the percentage of graduates who passed the test. You must have a bachelor's degree from an accredited college or university, and a minimum of 15 hours of undergraduate classes in psychology including a statistics course, an experimental laboratory course, and a course in abnormal psychology, each with a minimum grade of "C". Outstanding candidates meeting the majority of these requirements are sometimes granted provisional admission to the program. Full admission is then contingent upon fulfilling remaining requirements during the first semester of study at Washburn. The application and all supporting materials should be received by the Psychology Department no later than March 15 to ensure full consideration for Fall semester admission. Deadline for all application materials: March 15. You may start the application, save your work, and return to complete the application later. The $40 application fee is paid at the time of submission of the completed application. As you fill out the application, you will be asked to provide the email address for three people who will be providing letters of recommendation for you. After you have submitted your completed application, the system will generate an email to each of your letter writers. That email will direct them to a link where they will upload their letters. These letters need to be uploaded by March 15; therefore, we recommend submitting your completed application at least 2-3 weeks prior to this deadline. The application will give you the opportunity to upload unofficial transcripts, which is recommended but not required. Official transcripts should be sent by your university to etranscripts@washburn.edu or mailed to the Washburn University Registrar. The application will also ask you to type in your GRE scores. Official GRE scores must be sent directly to the Psychology Department. Q 1. When is your application deadline? A 1. March 15 for the fall semester; December 1 for the spring semester. Q 2. I graduate in December. Can I start the program in January? A 2. Yes. Although you won't be able to complete the program in two years (it would be a minimum of 2 ½ years), there are several courses that you could take that would get you well on your way towards your M.A. Q 3. Do I need the GRE? How do I get signed up to take it? A 3. We require the Graduate Record Examination (GRE) General Test (Verbal, Quantitative, and Analytical scores). We do not require the Subject test in Psychology but if you take it, you are welcome to submit your scores. The GRE General Exam is administered by computer and is scheduled individually. Information about the test and how to register is available at http://www.GRE.org. You should have your scores sent directly from the Educational Testing Service to us. Q 4. Do you have an application fee? A 4. Yes. We have a non-refundable $40 application fee. Q 5. I didn't do very well on the GRE. Does your program have cut-offs? A 5. No. We consider all aspects of the application in making our admissions decisions. Undergraduate grades, letters of recommendation from faculty, research and volunteer/work experience as well as GRE scores all enter into our decision. Q 6. What do you require for the application? Q 7. How do I get an application form? Q 8. I wasn't a psych major in college; can I still be considered for the program? A 8. Yes. You must have a bachelor's degree from an accredited college or university, and a minimum of 15 hours of undergraduate psychology including a statistics course, an experimental laboratory course, and a course in abnormal psychology, each with a minimum grade of "C". Q 9. I haven't had one of the psychology courses you require. Can I still be admitted? A 9. Outstanding candidates who are missing a requirement are sometimes granted provisional admission to the program. Full admission is then contingent upon fulfilling remaining requirements during the first semester of study at Washburn. Q 10. Do you require a campus interview? A 10. Although we are delighted to meet with you should you want to visit our campus and meet with faculty members or students, a campus interview is not required. Please feel free to contact us if you would like to arrange a campus visit. Students not currently meeting criteria for full admission are encouraged to seek special student status. The department accepts students as part-time, non-degree seeking candidates, or students presently enrolled in other graduate programs who need graduate courses in Psychology. Several graduate courses are available to social workers, nurses, teachers and members of other professional groups eligible for continuing education credit. Students may enroll for a total of only six credit hours as special students. Students who wish to enroll with special student status need to complete the Special Student Application Form and send it to Theresa Young- theresa.young@washburn.edu. Students who do not fulfill the Standards of Achievement are strongly encouraged to apply via the processed outlined in the subsequent section ("Application Process"). Please notify the department upon completion of the application at psychology@washburn.edu. You may enter zeroes for the GRE scores on the application because GRE scores are not required for this application. as demonstrated through the completion of PY390 Directed Research. Members evidenced by a rating on item #9 of the Masters of Arts in Psychology “Recommendation Form” of “recommended” or “highly recommended”. Paperwork will be due from the student on January 15. The department will inform students of their acceptance by February 1. Students will be required to accept or decline the offer by March 15.
International students who will be attending Washburn on an F-1 or J-1 visa must first apply for university admission through the Office of International Programs. Please click here for more information. Overall score of at least 100, with a Speaking score of at least 26, and at least 22 in each of the three other subtests. Overall score of at least 7, with a Speaking score of at least 8 and at least 6.5 in each of the other three subtests. With a Bachelor's degree from a U.S. university, international students do not need to submit a TOEFL or IELTS score. International students must also complete the full MA in Psychology application process (see “Application Process” above).